Danish Army Specific: On the 9th of December 2005 The Danish Army Material Command signed a contract with Mowag regarding the deliverance of 85 Eagle IV. They were scheduled to be delivered from August 2006 with the last vehicles to arrive in December 2007. The vehicles eventually replaced the older Eagle I as well as a number of light- and un-armoured 4 x 4 vehicles. Before deployment to Afghanistan in 2009 a number of vehicles were issued the Pilar MK-IIw Integrated Gunshot Detection Vehicle Version. Besides projectiles the system can track single, multiple, burst and synchronised shots and RPGs, mortars, anti-tank missiles. The system is integrated with the Lemur Overhead Weapon Station (OHW) and the Battle Management System (BMS). The systems can work in manual mode with onscreen display of shot origin or in auto-mode where the OHW is pointed at the shot origin ready for fire. Historical: The Mowag Eagle IV was originally developed as a private venture by Mowag based on the experience obtained with the earlier Eagle I, II and III. All of which were based on the AM General Expanded Capacity Vehicle model of the HMMWV 4 x 4 chassis. Development of the Eagle IV started in early 2003. The vehicle is based on the Mowag DURO (DUrable and RObust) II chassis technology with roll stabiliser and the De-Dion axle system. It is used as a platform for various tactical mission roles such as reconnaissance, surveillance, command or military police tasks. Length: 5.54 m (216 inches). Width: 2.33 m (90 inches). Height: 2.53 m (98 inches). Weight: 8.800 kg (19.360 lb.). Armour: The passive armour protects from small arms fire, shell splinters and some mines. Attachment for smoke dischargers mounted front and rear. Engine: 6-cylinder Cummins, model ISBe 250, 5.883 cm3 (360 cubic inches) displacement, common rail, turbo charged, liquid cooled. Horsepower: 312 at 2.000 rpm. Transmission: 5-speed Allison, type 2500SP, automatic. Transfer case: 2-speed Mowag, type 2S 22. Tyres: 335/80 - R20 with run-flat core. without preparation: 1.0 m (39 inches). Armament: The vehicles will be fitted with an overhead weapon station. Additional: The engines complies with the EURO III rules regarding emission. ZF hydraulic power assisted steering. 5 ton Warn winch, model MIL 12 front mounted behind bumper. 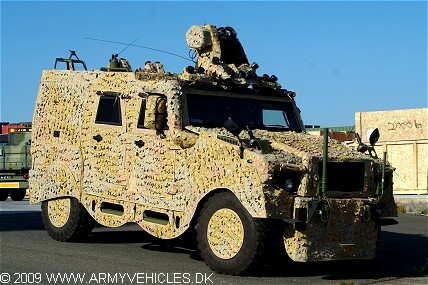 The shown vehicle is fitted with the Solar Shading and Concealment System (SOLSCONS) from Saab Barracuda LLC in order to reduce solar heating and obstruct thermal and visual reconnaissance.